In our new series, My Town, ordinary Russians introduce you to their cities and tell you what makes them unique. What is it about your town that you can find nowhere else? Another must-see place in Samara is the administrative part of the city, our equivalent of Moscow’s White House. The Samara region's government building by itself is not impressive, however, from the square in front of it there is a breathtaking view of the river, the embankment and the Zhiguli Heights. Here you can also see the Monument of Glory, one of Samara's most recognizable landmarks. A massive male figure holding wings in his hands, it symbolizes the heroic achievements of Samara's aircraft factory workers during World War II. Another pleasant place to go for a walk in the old town is Strukovsky Garden. Founded on the grounds of a 19th-century estate that belonged to a landowner who later went bankrupt, this garden has been one of most beloved places in the city for more than 150 years. Go for a walk along the shadowy alleys and find a grotto, a stone fountain and several miniature sculptures, including a refined little goat near the grotto and a loving couple by the entrance to the park. These sculptures are replicas of the artwork that could be found here in the 19th century. Next door to the museum is the Samara Catholic Church, an impressive gothic building and a kind of local equivalent to the Rouen Cathedral in France. The best time to come here is on Saturday mornings when you can attend the service and listen to the organ music. During the daytime the church is also worth a visit. Especially interesting are the surrealistic pictures of the regional natural history museum that was located here during the Soviet times. Just imagine seeing stuffed animals and dinosaur skeletons under these gothic vaults! Another wonderful trip outside of the city is to merchant and artist Konstantin Golovkin's summer residence, which was known as the “house with elephants.” It is best to take a guided tour here or take a suburban bus (30-40 minutes from Samara). Golovkin planned his estate by himself along with the city's main architect Valentin Tapfer. The house, built in 1908-1909, was erected in such a way that it produces different impressions if you look at it from varying angles – every facade has unique drawings and décor. Three-meter high elephant figures that guard the estate are the yard’s main attraction. 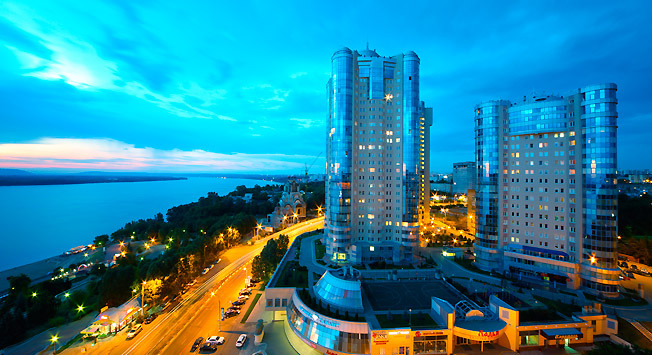 Samara's residents are representatives of a part of the Volga region that is much more laid back than in other areas. They lead a relaxed lifestyle and speak with a slight southern intonation, with locals stretching their vowels. Samara inhabitants are quite friendly, so if you ask for directions or just want to engage in genial conversation people will be very receptive. Moreover, Samara is a city with good old Russian hospitality habits, so it is likely that you will be invited to visit people in their homes for a conversation and some food. You should take this opportunity if it presents itself. Samara's main dishes feature different varieties of Volga fish. Foodies can order meter-long catfish at local restaurants (it is considered a local delicacy) and those that like to fish can go on a fishing tour and cook it by themselves. These tours are very popular in Samara in summer time. In winter ice fishing is possible only 10 meters away from the embankment. I would also recommend trying some of Samara’s other local specialties such fresh crayfish with beer, pike perch with creamed spinach or crucian carp cooked in sour cream. A popular edible souvenir from Samara is dried fish, which you can buy in the small shop at the Zhiguli Brewery. Samara is also home to one of Russia's biggest chocolate factories, Rossia. This factory produced numerous chocolate candy collections from the Soviet period and many of them are still widely consumed in present-day Russia.